Introducing a new Customer Relationship Management (CRM) system to your business is a complex undertaking. If implemented incorrectly, every element of your organisation can be impacted – resulting in a negative customer experience. 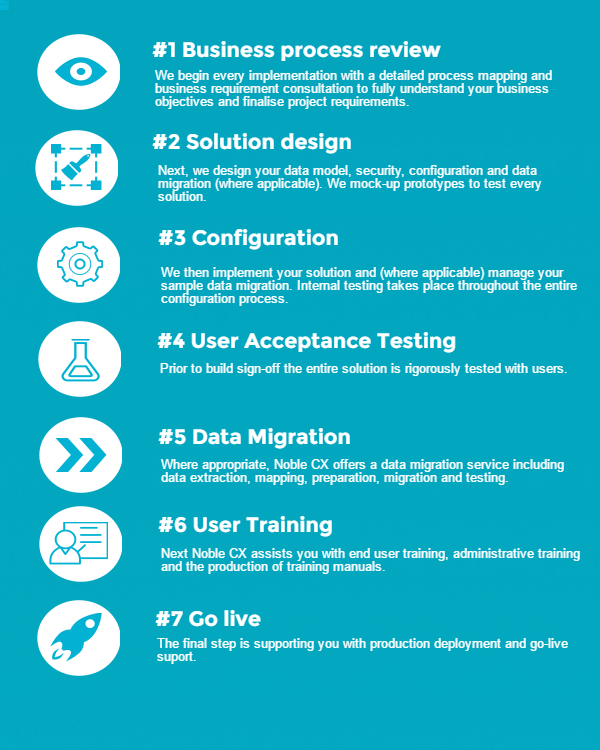 At Noble CX, we deliver a customised end-to-end implementation service to meet your unique business needs, reduce risk and maximise your investment in the Salesforce platform. Our Australian-based team partner with you and your business to customise, deploy and facilitate the adoption of Salesforce across your entire organisation. The result – a faster and more effective experience, fully tailored to the needs of your customers and staff. We partner with you to understand your requirements. Every business has a different customer experience goal. Our comprehensive implementation process ensures your specific business objectives and customer needs are met with bespoke cloud-based solutions.